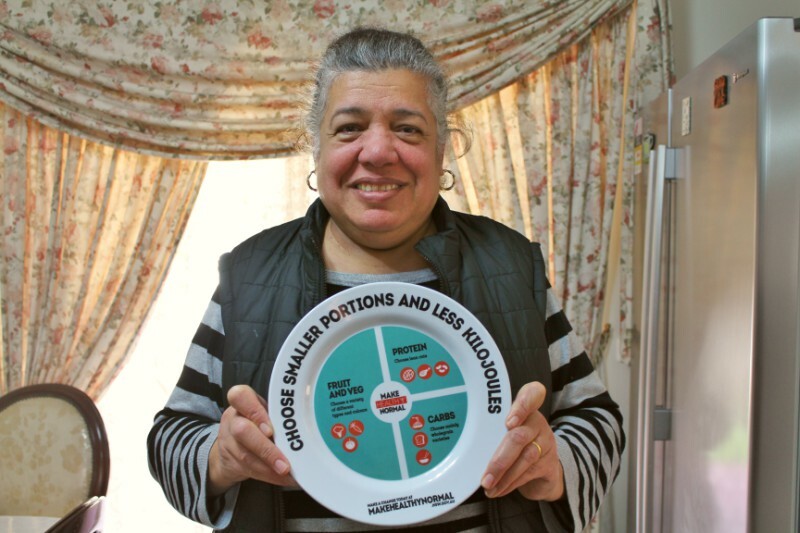 Egyptian-born Mervat Sidra is hoping to inspire other CALD women to make the first step to healthy living during Multicultural Health Week (September 4 – 10). The 58-year-old from Doonside has become a passionate advocate for the Get Healthy Coaching and Information Service, after the program helped her lose weight and manage her chronic pain. Mervat joined the program two months ago and has already lost five kilos through regular exercise and varying her diet. She said the free telephone-based service had been a great motivator and her coach Josh had been critical to her journey to better health. “For me, Josh is the Get Healthy Service; we’ve really focused on activity and food – I’ve been doing regular hydrotherapy and eating food that helps address my stomach issues,” she said. “Weight loss wasn’t my reason for joining but it’s been a great bonus; I really just wanted to better manage my pain and generally feel better. Mervat Sidra with Population Health staffer Rachael Graham. Mervat is now keen to encourage other women from diverse backgrounds to sign-up for the service. Get Healthy aims to help people make lifestyle changes including healthier eating, being physically active, reducing alcohol and maintaining regular weight. Qualified health professionals provide motivation, advice and support on healthy eating and physical activity. Western Sydney Local Health District’s Centre for Population Health deputy director Christine Newman said the Get Healthy Service was a great way to support people to make healthier choices. “From January to June 2017, around seven per cent of participants in the Get Healthy program from WSLHD reported speaking a language other than English at home,” she said. Since 2013, more than 1500 people in western Sydney have participated in the program. On average, people lose 3.8kgs and 5.1cms off their waist circumference. For more information, contact the Get Healthy Information and Coaching Service on 1300 806 258 – interpreters are available.